The Alhambra is a wildly popular foursquare model. It was offered for 12 years in the Sears Modern Homes catalogs. My website gets many visits from people looking for a photo of one. It's one of my favorite Sears houses too. 2734 Roslyn Lane, Highland Park. 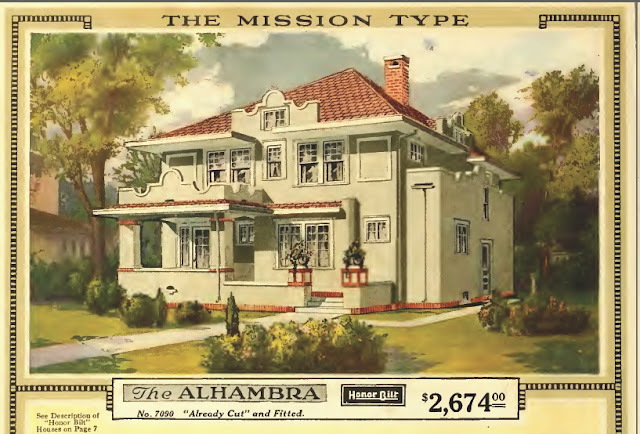 The Sears Alhambra, from the 1921 Modern Homes catalog. This authenticated Sears Alhambra in Highland Park was built in 1922, and "Sears Roebuck" is listed as the architect on the building permit. It was designated a landmark by the Highland Park Historic Preservation Commission in 1991. The house looks much like the catalog illustration, except the parapet over the front porch has been removed. The original owners were Harry J. Carlson, his wife Ruth, and their two kids. Harry worked as an interior decorator at the time the house was constructed. They lived in the house until at least 1940. Because I love the macabre, I must also mention that a woman was murdered in the house. In 1973, Lily Mae Walker was fatally shot and her husband George was shot in the mouth and leg during an argument with George's brother.